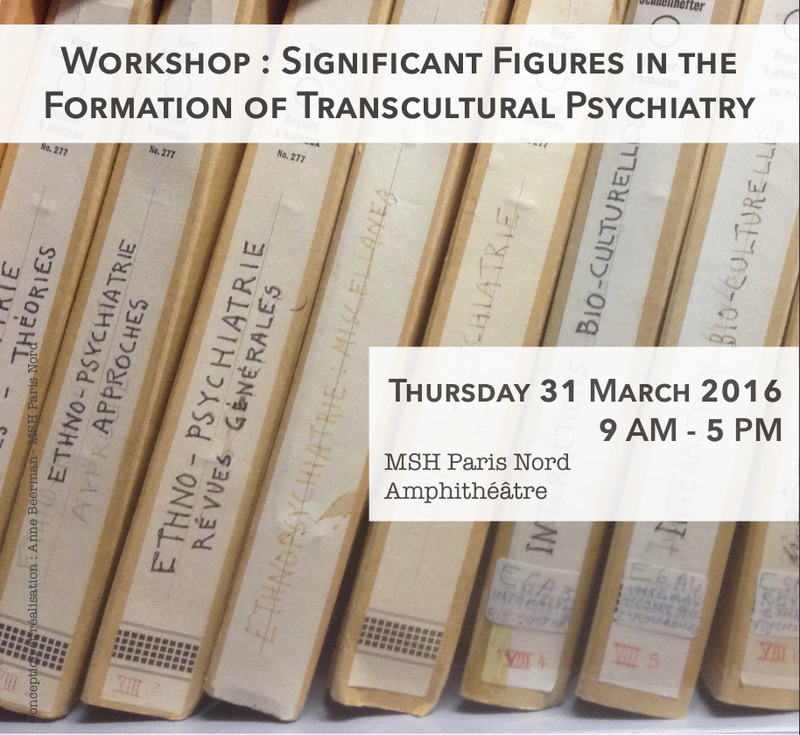 This workshop endeavours to comparatively evaluate the ideas and practices of some of the major contributors to the formation of the international discipline of transcultural psychiatry in the mid-twentieth century, a time that saw the transition from the colonial to post-colonial periods in many parts of the world, which had a direct effect on how mental illnesses were conceived of by psychiatrists sensitive to cultural differences. All of these psychiatrists had something different to offer the field. Emil Kraepelin, one of the major figures in late nineteenth-century psychiatry, made a number of research trips abroad, leading to his development of the concept of “vergleichende Psychiatrie” (comparative psychiatry), which fitted many ‘exotic’ mental afflictions into his general psychopathological framework, and with the specific aim of considering the impact of syphilis and alcohol on mental health, particularly it’s role in general paralysis. Eric Wittkower was responsible for founding the most significant journal in this field, Transcultural Psychiatry, which operated as a means of drawing together all of the published comparative psychiatry that was emerging in this period, as well as co-founding the first program dedicated to the subject at McGill University (between the anthropology and psychiatry departments). He was at the centre of a network that has dominated the field to this day. PM Yap, a Chinese physician trained in the UK at Cambridge University and the Maudsley Institute of Psychiatry, London, worked mainly in Hong Kong, where he developed the concept of “culture-bound syndromes”, one of the key intellectual achievements of the discipline in the mid-twentieth century. Georges Devereux was one of the theorists to span anthropology, psychoanalysis and psychiatry in his original work on Native Americans, and made many important contributions to the field of comparative ethnopsychiatry. French psychiatrist Henri Collomb drew together researchers from anthropology, sociology and psychology at the University of Dakar (Senegal) to produce a new form of transcultural psychiatry that was sensitive to the effects of colonization and decolonization, much of which was published in the new journal Psychopathologie africaine, founded in 1965. Marianna Scarfone’s paper considers the contributions of Italian ethnopsychiatrists working in Africa (such as Angelo Bravi and Mario Felici) and their impact on Italian psychiatry. All of these psychiatrists made very significant contributions to the ways that that psychiatry addresses non-western cultures, although rarely is there an opportunity to comparatively assess their work and its impact on the field of transcultural psychiatry. This panel offers one such comparison, and is framed by Cornelius Borck’s reflection on the state of transcultural psychiatry in relation to the broader field of psychopathology, with its increasing biomedical interests. Anthropologist Anne Lovell will draw together these threads in her summing up of the workshop, followed by an open general discussion. Anne Lovell (INSERM, Paris): Discussant and Roundtable Chair. From the point of view of the discipline’s current self-understanding as a biological research enterprise, the “transcultural” branch of psychiatry describes an oddity at the margins. Out there, mental disorders relate to cultural conflicts and ethnic diversity. Some small islands within this territory managed to win recognition in DSM-IV as culture-bound syndromes, a victory that Arthur Kleinman famously questioned a Pyrrhic. Our conference on “significant figures in transcultural psychiatry” provides an opportunity to reflect upon its development vis-à-vis the dominance of biomedicine so often taken for granted even in psychiatry. For doing so, I will combine a historical approach with an STS perspective. My starting point are the scientific practices and working routines of academic psychiatry as it established itself as a research discipline specializing in the observation, investigation and treatment of mental disturbances. Since its beginnings in the 19th century, psychiatry searched for objective criteria demarcating psychiatric illnesses and hoped to identify their biological substrates. After more than a century of more-or-less ill-fated attempts, the latest move is the abandonment of disease entities tout court and their replacement by diagnostic markers and research domain criteria (RDoCs). In the light of biological psychiatry, research has not yet succeeded to solve the riddle of mental illnesses, regardless of promising starting points, major breakthroughs and recent advances. From an ethnographic perspective analyzing science in action however, this situation can be described as the effect of the very attempt of psychiatry’s biological scientification. The specific practices of the research projects paved the way to the frustration along the course of psychiatry’s unfolding. De-colonizing psychiatry from the dominance of its biological trajectory opens for alternative evaluations of its past. Transcultural psychiatry here presents – together with psychopathology and anti-psychiatry – as one of only a few opposing projects. In contrast with the other two, however, transcultural psychiatry shares with traditional and biological psychiatry the empiricist orientation and the trust in numbers. Transcultural psychiatry’s impact upon the discipline may perhaps have been rather limited so far, but it invites reflection upon the discipline’s history differently. Emil Kraepelin’s significance for the history of psychiatry is hard to over-estimate. His classification of mental illnesses published in his Textbook of Insanity (1st ed. 1883; last 8th ed. 1909/1910) not only systematised psychiatric conditions into two main groups (dementia praecox (schizophrenia) and manic-depression, with epilepsy also accounting for some mental disturbances), but his biological conceptions of mental illnesses, so strongly opposed to Freudian conceptions that dominated the period 1920s – 1970s, were revitalised in the 1970s to reconstruct the third edition of the Diagnostic and Statistical Manual of the American Psychiatric Association (see Decker 2013). This clear move away from psychoanalysis has been considered one of the key changes in psychiatric theory in recent decades, laying the groundwork for the biological models of mental illness that dominate the field today, which are associated with the pharmacological revolution in psychiatric medicine. This position would at face-value seem to be opposed to the apparently culturally-relative interests of modern transcultural psychiatrists. Kraepelin was, however, also very interested in mental illnesses in other cultures, in particular the way that they matched (and differed from) his conceptions of mental illnesses in European patients. His psychological training under Wilhelm Wundt made him sensitive to socio-cultural factors, which in turn informed his researches outside of Germany. This paper considers Kraepelin’s visits to asylums in Colombo in Ceylon (Sri Lanka), Singapore and particularly Buitenzorg (Bogor) in Java (Indonesia) in 1904, and to the USA, Cuba and Mexico in 1925. It analyses the impact of Kraepelin’s ideas about mental illnesses in other cultures on the nascent field of transcultural psychiatry, and in particular shows his research interests into the effects of syphilis and alcoholism on mental health. Italian colonial psychiatry has not been analysed by scholars or psychiatrists since those countries gained independence. Advocates of psychiatric assistance and theorization in Italy’s African territories were few and had scarce, if any, impact in the mother country. Furthermore, Italy has not experienced the arrival of many ex-colonial subjects, so that no links were established, à la Fanon, between colonial psychiatry and the eventual treatment of migrants in the psychiatric services of the mother country. Research into these matters is recent and corresponds to the desire on the part of historians, psychiatrists and ethno-psychiatrists to question and analyse neglected practices and theories at the intersection between colonialism and psychiatry – in a context of increasing critical social and cultural historiography of the colonial period and the emergence of ‘colonial madness’ as an object of inquiry in international historiography; the questioning of established psychiatric practices; growing immigration and the consequent emergence of ethno-psychiatric services. This paper tackles the unquestioned transition from colonial to postcolonial psychiatry in Libya, the Italian colonial “fourth shore”, analysing the clinical practice of doctors Angelo Bravi and Mario Felici, as can be inferred from their contributions to “ethno-psychographic studies” (Bravi) and to “comparative psychiatry” (Felici). It also explores the intellectual origins of ethno-psychiatric practice in Italy, which, as argued by two of its most important protagonists (Roberto Beneduce and Pietro Coppo), have arisen from studies of popular culture and medical anthropology, as the research of Ernesto De Martino and Michele Risso in the second half of the 20th century attest. Eric Wittkower (1899-1983) founded McGill University’s transcultural psychiatry section in 1955, and one year later started the first international newsletter in this academic field, which became (and remains) the main journal in the field, Transcultural Psychiatry. However, originally trained as a specialist in internal medicine, at the beginning of his career Wittkower gave no signs that he would become a psychiatrist or that he would be interested in social sciences. Born in Berlin to a Jewish family, Wittkower left Germany in 1933 in consequence to the Anti-Jewish Laws, and moved to London, where he became a psychiatrist and psychoanalyst. He developed a reputation as specialist in psychosomatic medicine during the Second World War, and was hired at McGill University in 1951. To start with, my presentation will point out the historical context of the post-war period, when Wittkower founded a research unit at McGill University together with an American anthropologist, Jacob Fried. To continue, using archival material from McGill, I will focus on the history of scientific networks and the circulation of knowledge, particularly on the exchanges between the French- and English-speaking academic cultures in North America. Because the history of transcultural psychiatry is a transnational history par excellence, this leads necessarily to the important question of the reception of this academic field abroad. Finally, I will consider the role the French-speaking scientific community in Montreal played for the spread in other countries of McGill’s methods and results, by making use of one example – the French journal L’Encyclopédie Médico-Chirurgicale (EMC, 1965 and 1978). Pow Meng Yap (1920-1971) was a Hong-Kong born psychiatrist who trained at Cambridge University and The Maudsley Institute for Psychiatry, London. After his training, he returned to Hong Kong, where he spent the majority of his career, although he also held positions in Canada and Hawaii, and was active in the World Health Organisation and the World Psychiatric Association. Throughout his career, Yap payed particular attention to mental illnesses “peculiar” to non-western cultures, from his first paper published on the topic in 1951, to his posthumously-published book Comparative Psychiatry (1974), in which he explored the intellectual foundations of the subject from a philosophical as well as psychiatric perspective. In addition to paying special attention to certain mental illnesses that were commonly associated with non-western and to studying cultural variations across ubiquitous mental disorders (particularly his studies of suicide in multiple cultures), Yap developed the central concept of mid-twentieth transcultural psychiatry – the culture-bound syndrome – which is still discussed in contemporary transcultural psychiatry. Such syndromes were believed to exist solely (or mainly) in particular cultures, and Yap paid special attention to conditions such as latah and koro, which had been held up as the exemplary non-western mental illnesses at least since Emil Kraepelin’s 1904 visit to his Dutch colleagues in colonial Indonesia, and to W. Gilmore Ellis in Singapore. Yap, unlike Kraepelin, did not believe in the universality of mental illnesses, and made a point of demarcating these afflictions as belonging to (or being “bound” by) particular cultures. In doing so, he distanced himself from the Culture and Personality School of anthropology. Yap’s concept set the framework for much work in the field of transcultural psychiatry until at least the 1980s, where this form of cultural relativism began to come under scrutiny with the development of new diagnostic criteria associated with the DSM-III (1980). This paper outlines Yap’s contributions to the field of transcultural psychiatry in order to make comparisons with the other psychiatrists being addressed in this workshop (Emil Kraepelin, Eric Wittkower, Henri Collomb and Georges Devereux). This paper introduces the significant theoretical contributions of Georges Devereux (1908-1985) on the relationship between culture and psyche, which he developed in his work at the interface between anthropology, psychoanalysis and psychiatry during the mid-twentieth century. Devereux was one of the key early contributors to the field of transcultural psychiatry; he was in touch with its most important exponents, although he remained critical of many of the popular trends developed in this field of research in the United States, where he conducted most of his research between 1932 and 1963. The areas against which Devereux positioned himself included: the Culture and Personality School of anthropology (championed by Ruth Benedict, Margaret Mead, Edward Sapir and others); Géza Róheim’s Psychoanalytic Anthropology; neo-Freudian contributions to transcultural research within mainstream American psychiatry; and neo-Kraepelinian transcultural psychiatry, which has since become more prominent in the United States. Although his work related in some ways to all of these schools, Devereux never accepted the cultural determinism or psychic reductionism implied by any of these theoretical positions and, as apart of his critique, he founded a new epistemology: ethnopsychoanalysis (which was based largely on the concept of complementarity and countertransference, as well as on his clinical work). Investigating cultural alterity within this epistemological framework, Devereux discovered the presence of what he called the “universal operation mechanisms” of psychism and culture. With this assumption, and building on the work of two of his mentors, Marcel Mauss and Sigmund Freud, Devereux proposed a method of investigation that positioned the “alien” (the cultural ‘other’/the pathologic individual) as a privileged place from which to observe of human nature. Henri Collomb (1913-1979), a French physician, received the first chair of Neuropsychiatry at the University of Dakar at the moment of decolonization. But he rapidly distanced himself from the neurobiological approach to show interest in assisting psychically-ill patients and to improve community structures inherited from colonial period. Through collaboration with a new generation of researchers in the departments of Sociology and Psychology at the University of Dakar, he developed an interdisciplinary dialogue and succeeded in creating a new approach composed of cultural psychiatry, medical anthropology and psychoanalysis. The methodological and theoretical innovations of such an approach are particularly well illustrated in his book L’Œdipe africain (M.C et Ed. Ortigues 1966) and in his numerous contributions to the journal Psychopathologie africaine, founded in 1965. This presentation will show how the contributions of the Dakar team were innovative, diverse, and encourage clinical work and field research.